Every day in the UK an average of 17 babies die – 10 will die at birth and 7 in the first few weeks of life. Overall that’s about 6500 babies every year – the equivalent of 16 jumbo jets crashing or as one clinician put it to me, a large maternity unit delivering only dead babies. And these rates have remained almost the same since the mid-90’s. In spite of improvements in maternity care and advances in technology in caring for tiny babies, while the rate of neonatal deaths has fallen slightly, the stillbirth rate has remained virtually static. The UK doesn’t fare well compared to the rest of the Europe either. Our rates are worse than Norway and Holland. And Scotland has one of the worst rates in Europe – worse than poorer countries like Estonia, Malta and Poland. What many parents don’t realise is that the chance of a stillbirth is 10 times more common than cot deaths. And there is a greater likelihood of having a stillbirth than having a baby with Downs syndrome. One mother, over 40 and having her 3rd cycle of IVF told me that throughout her pregnancy the risk of Downs was repeatedly mentioned and she had every conceivable test to diagnose it. But no-one told her that the chances of her baby being stillborn was many times higher. She wished she had known. But although expectant mothers are warned of about smoking and drinking, and there is discussion about Downs syndrome, the risk of the baby dying isn’t raised. The death of a baby is an uncomfortable subject which no-one really wants to talk about. It wasn’t so long ago that mothers rarely had a chance to see or hold their stillborn babies. The thinking was that it was better for the mother not to see her baby, as if it had never even happened. Called the ‘rugby pass’ management of stillbirth – because of the way in which the babies were literally whisked away from their mothers – it wasn’t until the mid – 80’s that the thinking slowly began to change. Nowadays its very different. Parents are encouraged to hold their babies and take photographs, to have keepsakes such as a lock of hair or a handprint. And in many hospitals there are specially trained bereavement midwives who will provide counselling and support to parents during this very difficult time. However, although there are many reasons why babies are stillborn or die in the first weeks of life such as a failure to grow, congenital abnormalities and problems with the placenta, over half of stillbirths are still “unexplained” which means that no actual cause of death has been found. Undoubtedly some of these baby deaths cannot be avoided but its surprising how little research has been done into stillbirth compared to Downs and cot death. In Downs for example there have been tremendous improvements in screening programmes in pregnancy so parents have a greater chance of knowing what the risks are giving them the choice of continuing with the pregnancy. And there has been a sharp fall in the number of cot deaths sine the “Back to Sleep” campaign in 1991 when parents were advised to put their babies on their backs to sleep. But investigation into stillbirth and early neonatal deaths lacks far behind. The most important thing for parents faced with this devastating situation is to be able to understand why it happened. There may have been specific medical problems, but on the other hand it may have been totally unexpected. Parents should be offered a post mortem examination for their baby. Although the numbers of postmortem examinations are increasing, they only take place in about 40% of cases. There are many reasons – parents have to face a discussion very soon after their baby has died and they will be understandably distressed, and shocked if the death was unexpected. The consent forms which have to be signed are lengthy and quite graphic. And because of a shortage of perinatal pathologists who are specially trained to carry out these examinations, parents simply can’t face the thought of their babies often having to be taken on long journeys. But its a very important part of the process of finding out why. In most cases very helpful information is identified including in some cases the cause of death. The results will be able to help guide the management of future pregnancies and where the post mortem shows the baby was perfectly healthy, it will help parents to understand that there is no reason why there should be problems next time. Every time this happens, the hospital holds an internal investigation, an opportunity for parents to ask questions and to hear from the clinicians what happened. But in the last few weeks I have spoken to many parents who have struggled to find out answers and who have felt there has been an unwillingness to answer their questions. And we mustn’t forget not all of these grieving parents will have the energy to pursue answers making it even more important for there to be greater openness on the part of the doctors. But as with post mortem examinations, and the provision of bereavement services, the level of investigation and review varies throughout the country. Although there are guidelines for best practice in all of these areas its very much left to individual hospitals to set up and and manage their own procedures. Clinicians and campaigners like SANDS, the charity which supports parents after a stillbirth or neonatal death, say there is a lack of resources in the Health Service which needs to be addressed if there is to be consistency in the support parents are offered and there needs to be a great deal more research if the numbers of babies dying are to be reduced. The UK has some of the highest rates of stillbirths and early neonatal deaths in Europe. There have been calls for improved care in hospital labour wards and an increase in research efforts to discover why so many apparently perfectly normal babies die. However there is growing concern that in some hospitals, these deaths are not being properly investigated. Parents report difficulties in finding out full details of what went wrong. Shortages of specialist pathologists have meant that crucial post-mortem examinations are never carried out. And the inquest system is patchy when it comes to discovering the cause of a new born baby’s death. For ‘File on 4′, Ann Alexander investigates. File on 4 on BBC Radio 4. My next documentary for BBC Radio 4 and my first for File on 4 is being broadcast on 26th January at 8pm. The programme tells the story behind AstraZeneca’s bestselling antipsychotic drug Seroquel and its apparent side-effects, including severe weight gain, diabetes and other serious medical conditions. Seroquel was launched in 1997 for treating schizophrenia and later for bipolar disorder. John Blenkinsopp, who was the company’s UK medical adviser when the drug was launched, explained to me how he was pressurised by the company’s marketing arm to approve claims about the drug which he felt did not reflect the medical evidence. As a result of these effects over 14,000 people in the US are now suing the UK-based pharmaceutical firm. Through interviews with people associated with the multi-million pound pharmaceutical industry, l look into concerns about how drugs are marketed and ask how much the public should be told about the medications they take. As part of my work at The British Institute of Florence I am helping prepare for their annual Summer School which takes place in the beautiful medieval hill town of Massa Marittima in the heart of the Maremma area of Tuscany. I participated in the Summer School last year and couldn’t believe how this part of Tuscany which I had never visited is surprisingly still little known to mass tourism. Surrounded by dense luxuriant woods, with ancient fortresses, churches and castles, many dating back to the Middle Ages, Massa Marittima is only twenty minutes from the Tuscan coast and is within easy reach of many places of interest, including particularly the ruined Cistercian abbey at San Galgano – and it is little more than an hour from one of my favourite places, the historic city of Siena. The Institute’s Summer School offers a complete immersion into Italian language and culture. Every weekday morning there are intensive Italian language classes at different levels. Everyone, whatever their level, is encouraged to communicate in Italian from the very first day. The Institute’s delightful and very experienced team of Italian language teachers uses an interactive method aimed at developing confidence in the spoken language and broadening knowledge of day-to-day Italian life. Last year there were some absolute beginners and they soon felt confident in conversing with the locals many of whom speak very little English. In addition every day there is an opportunity to experience more about all things Italian. For example each year there is a course – and several tastings! – on Tuscan wines. This year the School is introducing classes on the art of making home made pasta, and the production of olive oil. There will also be a visit to the ancient and very pretty seaside town of nearby Castiglione della Pescaia. 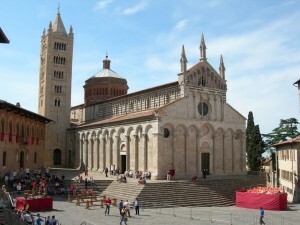 Best of all however, the Summer School is timed to coincide with Massa Marittima’s famous open-air opera festival, which takes place in the Piazza Garibaldi, a tour de force of medieval city planning. This year is the turn of Puccini’s Tosca and Donizetti’s Don Pasquale. The operas are performed against a backdrop of the magnificent Cathedral, one of the finest religious buildings in Tuscany. The Balestra del Girafalco which takes place on the 2nd Sunday in August each year is a famous re-enactment dating back to medieval times with villagers in colourful historical costumes, representing the three districts engaging in a crossbow competition seeking to pierce the heart of the “corniolo”, the heart of the gerfalcon, the bird of prey that symbolically represents the enemy. And if that isn’t enough there is San Lorenzo’s feast day on August 10th with Calici di Stelle – the night of falling stars when everyone takes part in the traditional nighttime wine festival in the streets of Massa Marittima and samples locally produced wines and olive oils. The classes are held at Massa’s old seminary building right at the top of the hill with beautiful views over the surrounding countryside. Last year the whole course was tremendous fun with a really interesting group from the UK, the US, Germany and Japan. I am really looking forward to this year’s Summer School which promises to be even better. For further information do have a look at the Institute’s website. 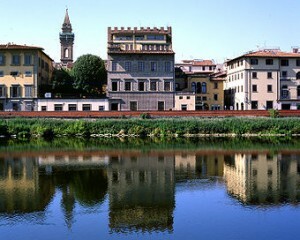 One of my clients is The British Institute of Florence and I am doing some business development work with them. They are great clients to work with and spending time in Florence – well I can hardly complain about that! In case you have never heard of it, The British Institute of Florence (or “bif” for short) is a cultural institute in Florence, Italy with the aim of promoting Anglo-Italian understanding, teaching English and Italian languages and History of Art, and running a lending Library of English books to illustrate British and Italian literature, art, history and music. It is also the oldest overseas British cultural institute in the world. The Institute was set up in late 1917, towards the end of the First World War, by a group of Anglo-Italian scholars, intellectuals and public figures who were keen to create a cultural centre in the city of Florence and to counter the anti-British propaganda of the time. You can read more about its history on the Institute’s website but one thing learned from wikipedia I never knew was that apparently D.H. Lawrence went into the British Institute one day, upset by the then Director’s Fascist leanings, and shouted ‘This is the Anti-British Institute’. He was forcibly ejected! Based in two separate buildings in the historic centre of beautiful Florence in the heart of Tuscany, the British Institute today offers a wide range of courses throughout the year including Italian for non-Italian speakers, English for Italians and fascinating courses on the History of Art – and where better to be based? I first became aware of bif when I decided last year that I wanted to spend a month in Italy learning Italian. Not knowing where to start I turned to the Internet and after some searching decided that I wanted to spend my month in Florence or Siena. I just couldn’t believe the number of courses which were on offer but I soon whittled my list down and after a half hour on the phone with Juliet at the Institute I decided that the British Institute in Florence was the place for me. I shall write more about my trip another day but suffice it to say that I had a wonderful time. I became immersed in my Italian classes. As their style of teaching Italian is to speak only Italian and the first phrases I learned were “Come si dice? – How do you say it?” and “Che significa?- What does it mean?”. I discovered Florence and I completely fell in love with Italy and everything Italian. This year I attended their summer school in Massa Marittima, a beautiful hill town in the Maremma district of Tuscany – much more about that to follow. I spend my working life now mainly doing Consultancy in Business Development and Communications (more about me on my website) and as my very first foreign project I am delighted to be involved a project with the British Institute. As deputy chairman of UK networking organisation, The Legal Alliance, Ann Alexander works to make the legal sector more accessible and promote quality in the legal service delivery. She talks to Women Legal about a career spanning decades and disciplines. In the past 30 years, Ann Alexander has transformed herself from pioneering clinical negligence specialist and founder of UK-based personal injury firm Alexander Harris to business-development consultant, and most recently to change advocate in the legal sector. Public inquiries are cathartic for grieving families but often fail to address the very failings they identify. In recent years, public inquiries have become part of the fabric of our political life. Their recommendations are often the platform for major public policy changes. When powerful organisations and government agencies appear to fail in carrying out their responsibilities, sometimes causing catastrophic human tragedy, there has to be a mechanism in place to effect change. Usually such inquiries follow a major disaster or matter of controversy, where there is suspicion on the part of the community involved – such as the parents whose babies died at Bristol Royal Infirmary and the families whose relatives were murdered by Harold Shipman. They are looking for the truth to be discovered in a wholly independent forum where lessons will be learned and recommendations will be made to make sure something similar cannot possibly happen again. But most importantly they want complete transparency – for the search for the truth to be conducted in public with proper scrutiny open to all. And while inevitably part of that truth will be attributable to some human failing or misdemeanour, it is the exposure of evidence of systemic failure which is vital to identify where and how change must occur. And there must be change if a similar tragedy is to be prevented. Believe it or not, before the Laming Inquiry into the death of Victoria Climbie, there had been a staggering 70 public inquiries into recent child abuse cases, producing thousands of recommendations. Yet scandalously children were still dying. often in horrific circumstances. How many of those deaths could have been avoided? So how effective is our public inquiry system? Could it be more effective and, if so, how might it be improved? As a clinical negligence lawyer, I acted for families involved in a number of inquiries, most notably Shipman. In that case the families even had to judicially review a government decision to hold the inquiry behind closed doors. And yet the subsequent inquiry, chaired by Dame Janet Smith, concluded that Shipman had killed more than 215 of his patients and identified extensive failings in the systems in which general practitioners operate – loopholes which Shipman had used to escape detection. I am often asked what the point of a public inquiry is and whether the millions of pounds spent are justified. Recently, I interviewed a number of people who have worked on or ran inquiries to find out how they work, whether they really do work, and whether lessons are learned and changes implemented. Lord Laming told me that a balance must be struck between thoroughness, fairness and efficiency. After all, while individuals will be open to criticism, an inquiry is a means of strengthening the accountability that we should expect of individuals and organisations that have power over the lives of others. But after the government has considered the weighty reports and reflected on the evidence taken, what then? As former health secretary Frank Dobson told me, that’s all they are: recommendations. In a Radio 4 documentary, I have explored not only the emotional dimension of dealing with major human tragedies, but also the search for truth. And while, for many, a public inquiry is undoubtedly cathartic, what still needs to be done? Since the Shipman Inquiry, I know that the government has still not implemented many of Dame Janet Smith’s recommendations, even though it formally accepted them. And there isn’t even a timetable to do so. There are some reasons for this: ministers are reshuffled from department to department; inquiry chairmen have no continuing responsibility and will in any event have moved on in their lives. I ask whether a mechanism must be put in place to make sure that, after the media spotlight dims, something is done to ensure those institutional and systemic failings are a relic of the past. Public Inquiries, researched, written and presented by Ann Alexander and produced by Jim Frank, will be broadcast as part of the Analysis series for Radio 4 on Thursday 30 October at 8.30pm, repeated on 2 November at 9.30pm. To comment, visit www.publicinquiries.org.uk after the broadcast. A surge in the numbers of companies putting employees through crisis training is thought to be a reaction to the credit crunch. Ann Alexander of Alexander Macdonald, a media training consultancy, said: “There is a real paranoia in certain sectors that their firm’s failings will be highlighted in the media and they will be tainted by a Northern Rock-style media trial. 1. Don’t crawl under a stone hoping the issue will go away. Equally, don’t make any hasty defensive comments. 2. Investigate quickly to establish if the story is true. Ensure you know all the facts before responding but remember speed is of the essence. 3. Make sure someone is available to speak to the press – ideally someone with seniority and not a press officer, as this will show that the issue is being taken seriously. Ensure that they are fully briefed and know how to deal with the media. 4. Don’t ever try to outsmart the media with smart or facetious comment and never, ever say ‘no comment’. You’ll only make things worse. 5. Acknowledge public concern, even if you think it is misplaced. In a media crisis, the public is always right. 6. Actions speak louder than words. The public does not want statements and press releases so always respond decisively – you must be seen to take swift action. 7. Make sure that you communicate with your key audiences – the customers and clients who will be affected by the story – on a more personal basis than through the press. 8. Discover which areas of your business are vulnerable to negative press coverage and prepare a plan in advance. 9. Have a crisis management plan ready that deals with the practical side of coping under the media spotlight. The plan should detail who will make the decisions and who will take calls from the media. Can your current press or publicity officer cope? Do you need extra help? 10. If you do have a plan, make sure you get it – common sense and intuition are fine but they need to be backed up with experience and expertise from a professional.